Situated just 3 miles from the A483, just outside the village of Cynghordy near Llandovery and an ideal base for exploring the heartland of Wales. 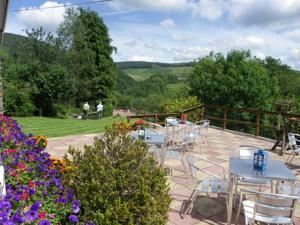 Set in 50 acres of Welsh countryside with spectacular views over looking the Bran Valley and the Brecon Beacons. B&B comfortable accommodation, where a farmhouse buffet style breakfast is served. Also two quaint self-catering cottages, which can cater for up to 17 people. Easy walking distance to sample what Llandovery has to offer and places to visit nearby include The Black Mountains, Llyn Brianne, Brechfa Forest, Dinefwr Park and Castle, National Botanical Gardens of Wales, Dolaucothi Gold Mines, The Royal Welsh Showground and Brecon Beacons National Park.